We are leading in manufacturing, exporting and distributing a wide range of Tarp Gauge. 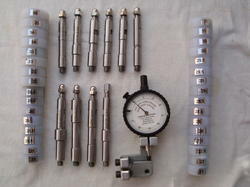 These are used for the measurement of top arm roller pressure in ring frames and speed frames. Our ranges of products are manufactured using top quality materials that are sourced from reliable vendors in the market. This gamut is checked on different quality parameters so that it performs superbly. These are available at economical prices in the market. We take pride ourselves in offering a superior range of Pressure TarpGauge, which is fabricated using best grade raw materials that are sourced from reliable vendors that ensure desirable durability and resistance against corrosion. This pressure gauge measures top arm roller pressure in jute draw frames for rubber cots dia. upto 300 mm and load upto 350 kgs. We offered range of products are widely used for the measurement of top arm roller pressure in ring frames and speed frames. We supply these to our clients at reasonable prices in the market. We are manufacturing and supplying a wide range of Sun Tarp Gauge. These are extensively used for the measurement of top arm roller pressure in ring frames and speed frames. Clients can avail these from us in a wide range at affordable prices at standard norms. Our professionals conduct various tests on the products so as to make sure these are flawless. Our ranges of equipments are available at competitive prices in the market. Sun Tarp Gauge facilitates this check up easily and directly on front, middle and back rollers in all types of drafting systems that are used in ring and speed frames.